Ps 102:16-18, 19-21, 29, 22-23 "The Lord will build up Zion again, and appear in all his glory." The nations shall revere you when the Lord has rebuilt Zion, appeared in his glory, and regarded the prayer of the destitute. The Lord looked down and heard the prisoners' groaning. Mt 14:22-36 (= yesterday's) Jesus made the disciples get into a boat then went to pray. When waves tossed the boat, he walked on the sea toward them. Seeing him, they were terrified: “It's a ghost!” Jesus / Peter: “Don't be afraid.” / “Lord, if it's you, command me to come to you.” / “Come.” He walked on the water toward Jesus but became frightened and started to sink: “Lord, save me!” Jesus, catching him: “You of little faith, why did you doubt?” They got into the boat, and the wind subsided. “Truly, you're the Son of God.” At Gennesaret, people touched his cloak and were healed. Creighton: If I, stuck in a rut, think my wound is incurable, I can take consolation in Jeremiah's prophecy: good news comes. God will rebuild and restore; the covenant will be renewed. In the gospel, the storm signifies loss of control. When Jesus appears to us, we like the disciples may not be sure it's Jesus, but he asks us to trust him and not let fear take over. We may test Jesus like Peter did, but if we focus on the storm instead of Jesus, like Peter, we sink; love, sacrifice, courage, service, healing a relationship, getting through the daily routine, become too much. Cry to Jesus like Peter. One Bread One Body: The Lord revealed his "incurable" people would be restored through obedience. Peter was called not just to look to Jesus but to follow him. We look to Jesus as servants to a master. As Jesus' obedience changed the world (Phil 2:6-11), so can ours. Passionist: "You of little faith" Greek = Ὀλιγόπιστε (oligo-piste, little-faith). Peter gave up everything to follow Jesus and saw his many works. "Little faith" in Jesus, Peter himself, or both? DailyScripture.net: Jesus urges his disciples to count the cost, but we as Peter can act on impulse. Peter clung to Jesus and grew in love and trust. Do I look for and rely on the Lord when I encounter difficulty? Universalis: Dedication of the Basilica of St. Mary Major ("Our Lady of the Snows"): The Rome basilica, oldest in the West dedicated to Mary, was built shortly after the Council of Ephesus proclaimed Mary as Mother of God; the title emphasizes Jesus was both divine but a man born of a woman. 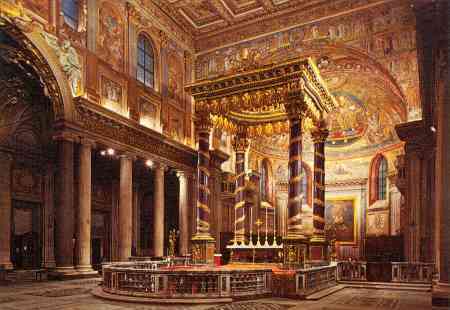 (St. Ignatius Loyola celebrated his first Mass there.) / Bl. Frédéric Janssoone, youngest of 13, Franciscan priest, military chaplain, preacher, fundraiser.